McCuistion has received numerous awards including the Suzanne and George Ramie Prize at the Biennale Internationale De Ceramique D'Art, Valluris, France in 1994. This was the most prestigious award received by an American in this International Juried Competition. 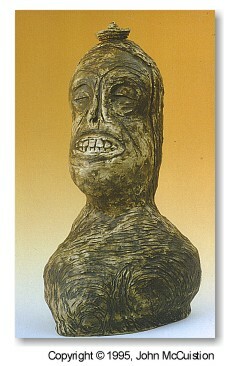 In May of 1996 McCuistion was awarded first place in the Fifth Annual Figurative Small works Exhibition held at the Armory Art Center, West Palm Beach, Florida. He received a National Endowment for the Arts Craftsman Fellowship in 1979 and has exhibited in over 170 shows since 1968. McCuistion's work has been included in a variety of publications over the years, and was most recently juried into The Best of Pottery, Rockport Publishers, Inc., 1996. His artwork is also part of numerous private and public collections including the Lamar Dodd Arts Center, LaGrange, Georgia; the Art Gallery of Greater Victoria, Victoria, B.C., Canada; the San Angelo Museum of Fine Arts, San Angelo, Texas; Arizona State University Art Collection; and the Fred and Mary Marer Collection, Claremont, California. In July of 1996, McCuistion was invited to participate in a special National Endowment for the Arts initiative to create a permanent archive documenting the Visual Arts Fellowship Program.